The greatest gift of success you could give to your child is to build their sense of self, their self-worth and self-esteem. Children are free beings (not fearful beings), so catch them before the world destroys their self esteem, because most often than not, it will. Kids are confident, fearless and they say what they want to say - they don't mince words. And what do we do as adults? We stop them! We tell them they are loud, big-mouthed, they ask too many questions and they should just shut up. We discourage and derail them. Sometimes we can't help it, but most of times we can. Parents should lead by example. Become more confident yourself and your kids are likely to follow. Teach your kids to be confident and proud of who they are; to take part in competitions but accept constructive criticism and defeat gracefully. Defeat, most of the times, has nothing to do with their abilities, and everything to do with what the judges are looking for. Let them know that. If they are to stand in front of people (speak in public), let them know that they should enjoy themselves first and foremost. Most people enjoy the sweet, innocent sound of a kid's voice anyway. Teach them to treat other kids (or people) with respect and dignity, and never to undermine or belittle anyone. Kids want fair treatment, as does all of us. But there are times when even adults can become cruel with kids. Our kids need to know that even adults do make mistakes sometimes and they should not let bad treatment by and from adults destroy their sense of self and belonging. I have personally witnessed too many adults make too many bad decisions to make my kids believe that adults are always objective in their decisions and judgement. Be kind, gentle, supportive and loving to your children. Listen to their stories and their concerns about the public appearance they are faced with, and deal with those fears & concerns kindly - with understanding, love and inspiration. 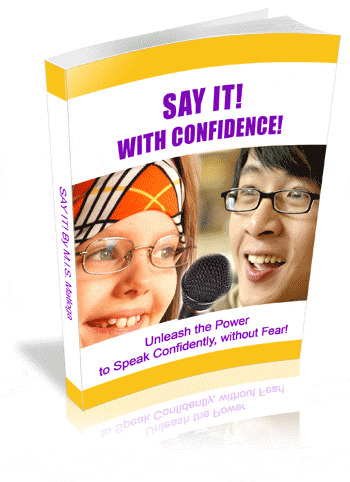 Work through that public speaking assignment with your child; lead and follow as the task may require. Praise him/her for every effort made and do not compare your son/daughter with other children. Do not focus on results; look out for their good qualities and affirm them. When they are going to perform/present or give a public address, let them know that everyone, including their audience, is wishing them well, but do it in such a way that the child is not pressurised to meet expectations.